Cattier Organic Shampoo for Dry Hair is deeply nourishing for dry hair thanks to the conditioning, softening and protective properties of Bamboo Marrow and Organic Oil of Macadamia. Rich in Wheat Proteins which composition is very similar to the keratin proteins in hair, Cattier Organic Shampoo for Dry Hair strengthens the hair at its very roots, leaving it easier to comb out. Essential Oils selected with the utmost care, have been added to enhance its cleansing properties and to leave the hair with a delicate fragrance. HOW TO MAKE BAMBOO SHAMPOOING ? 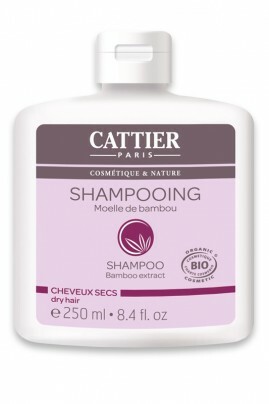 Apply Cattier Organic Shampoo for Dry Hair with Bamboo Marrow to wet hair and gently massage in, produce lather. Leave for a few moments, and then rinse thoroughly with warm water. Organic Aloe Vera, Organic Macadamia Nut oil, Bamboo Marrow, Plant vinegar (Lavander, Rosemary, Sage, Thyme), Wheat proteins, Glycerin (vegetable), Essential oil of Sage. Aqua, Lavandula Angustifolia Extract*, Ammonium Lauryl Sulfate, Sodium Cocoamphoacetate, Macadamia Ternifolia Oil*, Parfum, Cocamidopropyl Betaïne, Phospholipids, Glycolipids, Glycine Soja Oil, Glycine Soja Sterols, Vinegar, Glycerin, Lavandula Angustifolia Extract, Rosmarinus Officinalis Leaf Extract, Salvia Officinalis Leaf Extract, Thymus Vulgaris Extract, Xanthan Gum, Bambusa Vulgaris Extract, Maltodextrin, Hydrolyzed Wheat Protein, Sodium Chloride, Phytic Acid, Potassium Sorbate, Sodium Benzoate, Benzyl Alcohol, Lactic Acid, Limonene, Linalool. Très bon produit n'assèche pas du tout mon cheveux fin (difficile de trouver un shampoing qui leur conviennent !) seul petit hic il sent un peu fort mais avec l'après shampoing ou le masque que je mets l'odeur disparait par la suite. Shampooing à l'utilisation agréable, très doux.